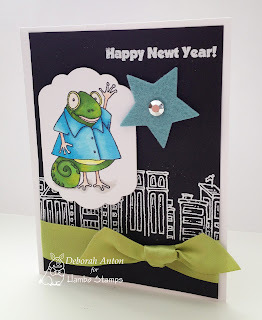 Today is Wednesday and I have played along with the Hambo Hoedown challenge! This week, we're getting sketchy and this is my take on that. I used Hambo Stamps Dirty Bird for the image which is colored in using Copics and cut out. I popped that up on the oval panel over some XL ric rack ribbon. I followed that with the coordinating sentiment and some border stickers from SRM. Come play along with us and earn your free digi just for doing so!! Be sure to stop by the Hoedown for the details and see what the other Bacon Bits have created! Thanks for stopping by! Just a simple Valentines card I want to share today that I have had in my mind for a while and I thought, if I don't do this now, it will be past Valentines Day! LOL! For this, I used some heart dies from Spellbinders which I cut out on my cs. I then sponged around the area with my distress inks before applying some dp from Basic Grey's Sultry collection to the back so the design pops through. The sentiment is a rub on from DCWV and I finished it off with some pleated and sheer ribbon, a wooden button, and some twine. This would be a great way to use up some scraps or even using some pretty fabric, if you have that, to make for some great cards. Thanks for stopping by and taking a looksee! I am off to do laundry before my hotel gets up and running Thursday. : ) We will certainly have a full house... but I love it! I can only wish it were Spring! 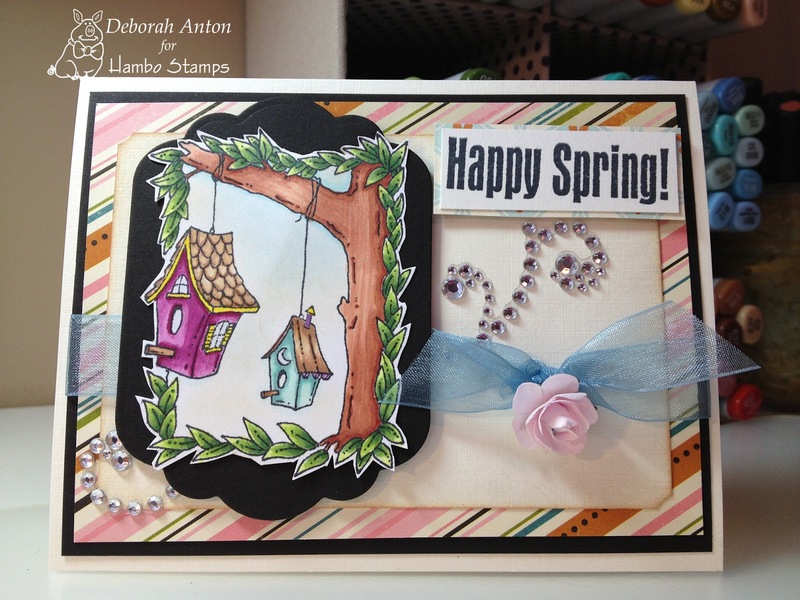 : ) I am over being cold I think, so I am playing with some of my Hambo Spring season stamps. I am most definitely ready! I hope you all are having a great start to the week! I couldn't help but play around some more with those fun glassine bags that SRM carries. I played along with Whimsie Doodles sketch challenge and decided to use that sketch on the bag to make for a Valentine for my husband. One he can take with him when he deploys to Afghanistan. Which happens to be a few days after. I took a photo from our last anniversary and changed it to an antique effect and printed it out. I put it on top of the dp while framing it with more of the SRM We've got your border stickers. I then used a piece of the Valentine border stickers that says, "Be my Valentine" that I overlapped on the on the bottom of the photo. I used a tab die cutout for the top while using another sticker that says "Be Mine" at the top overlapped with a heart cutout from Spellbinders. That heart is used as the pull out piece to take it out of the bag. So, something else to use your glassine bags for! : ) Thanks so much for stopping by and I hope you have a fabulous Saturday! The sun is shining here today so I will enjoy that!! It's been a good morning so far as this winter storm that rolled in last night has caused for a school cancellation. I normally wouldn't be so happy about that because there have been worse storms to cancel for, but I am needing some time to get caught up! : ) My husband is getting promoted in a week and I have been busy planning his reception and making things us crafty gals like to do. The military does not give you a lot of time to plan from when you are told you will be promoted, so it has been gangbusters the last 2 weeks! In this case of being crafty, one of the things I have been busy doing are some favors I will be putting out. I just love mini pillow boxes. They make for simple favors you can decorate any way you please. These boxes are from SRM Stickers. They carry 3 sizes of these heavy mil pillow boxes. Think of the possibilities you can do with them? In addition, SRM's stickers are clear and forgiving when you use them to decorate the boxes. The stickers come off clean if you make a mistake or want to change what you have done. How great is that? For these favors, I filled them with red, white, and blue Jelly Belly's and used SRM's We've Got Your Borders patriotic stickers and Stitches, as well as Stickers by the Dozen Patriotic. I had played around with covering the center with some dp and such, but I really liked the clear look with the stickers and beans to be the focal point. I made a sign using a clothes pin that will clip to the back that says, "Thank you for sharing our special day with us." I used some star dp, the flag sticker, and a border sticker to tie it all in. On another note, I do have some exciting news coming soon so stay tuned! I just can't spill the beans yet! : ) Thanks for stopping by and hope you all have a warm and dry day! I wanted to share with you some glassine bags that are all the crafty rage at this moment. SRM Stickers have them in 5 different sizes! While at CHA, SRM Stickers had some make and takes with the glassine bags and they are perfect with their stickers for decorating. While decorating these bags with SRM Stickers, no need to worry about misplacement- they peel right off to be fixed and placed where you want it. These are some samples I made quickly, but the decorating and uses are endless. And with 5 sizes that SRM carries, there is a bag for every need! If you are wanting more ideas with these bags, visit SRM's blog to check out what the designers have come up with. you are in the right place! If not, you might want to start back at the beginning at the Hambo blog to make sure you are eligible for the hopper prize! A prize will be awarded to one participant whose comic strip-themed creation tickles the Bacon Bits’ fancy in a hammin’ jammin’ way! Another prize will be awarded randomly to a hopper who comments on all of the blogs along the way. The winners will be announced on the Hambo company blog, Talk to the Ham, on Wednesday, January 23, as well as at the Hambo Hoedown challenge blog. We love comments anytime, but the deadline for prize entry comments is Sunday, January 20 at 5 PM CST. Don't miss it! Yes, I couldn't help but use this image to depict "Garfield." It was one of my favorite comics as a kid. I wanted to keep this image the focus as it really reminds me of something that little rascal of a cat would do to his friend Odie- Chilling on the water to act as if nothing he did happened. I colored the image with Copics and cut it out using my nesties. I finished it off with a simple ribbon and sponged around the inside. If you like this image and haven't been able to play with one of their fun digis, be sure to head over to Hambo Stamps Digi Store and download him! It's free! Now laugh on over to Dawn for another great Comic Strip that will tickle your fancy! Here is the full list of participants! Thanks for stopping by and have a great day! Deborah http://beadnstampn.blogspot.com -----------------> You are here! Well, I have returned from CHA and a great time as usual! It is always nice to see and hang out with friends whom you haven't seen in a year, and as a bonus, to see all the new upcoming lines of your favorite companies. It wasn't all fun as I did work a bit, but really? Do you call what you love doing "work?" :) Today, the schools are closed due to an ice storm we got last night, so it is perfect timing to allow me to get caught up and spend a little quality time with my boys after being away from them. I would like to share a quick and easy Valentine card I made using a simple embossing folder and a die cut heart, finished with some twine. This card could have a sentiment added of your choice and that will be what I will do when I give it. I just couldn't decide at the time I made the card. 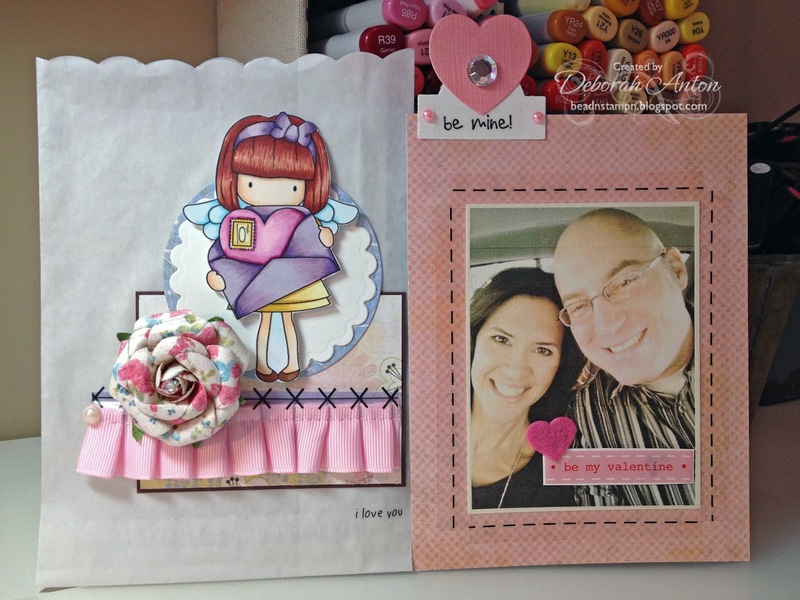 The heart is cut out using MFT's heart a plenty die-namics set. The center is a We R Memory Keepers 3-D sticker I had in my stash. 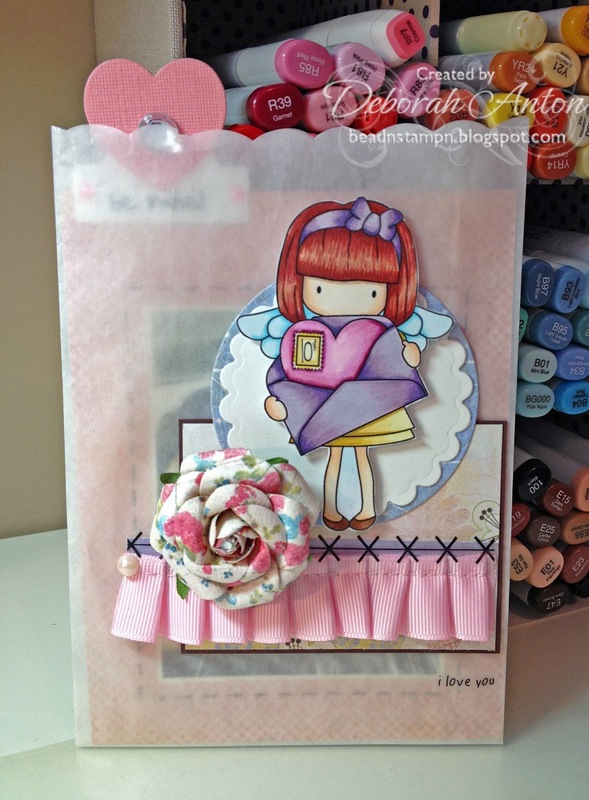 The twine is Studio G.
Tomorrow is Hambo Stamps Comic Strip Blog Hop!! Be sure to stop by Talk to the Ham to begin the hop and have your chance to win some free images! This should be lots of fun and laughs! I will close this post with a picture of my and bestie.. Always a great time!! Thanks for stopping by and have a great day! This weeks challenge is to incorporate felt into your project. I wasn't sure how felt would go along with Newt here, but I was able to sneak in a star cut out with my nesties. The felt is from MFT as well as the ribbon. I stamped the Hambo Skyline and sentiment with Versamark and used my white ep to create some dimension to the card. I stamped the image with Memento black and colored it in with Copics . The image was cut out using my labels nesties. 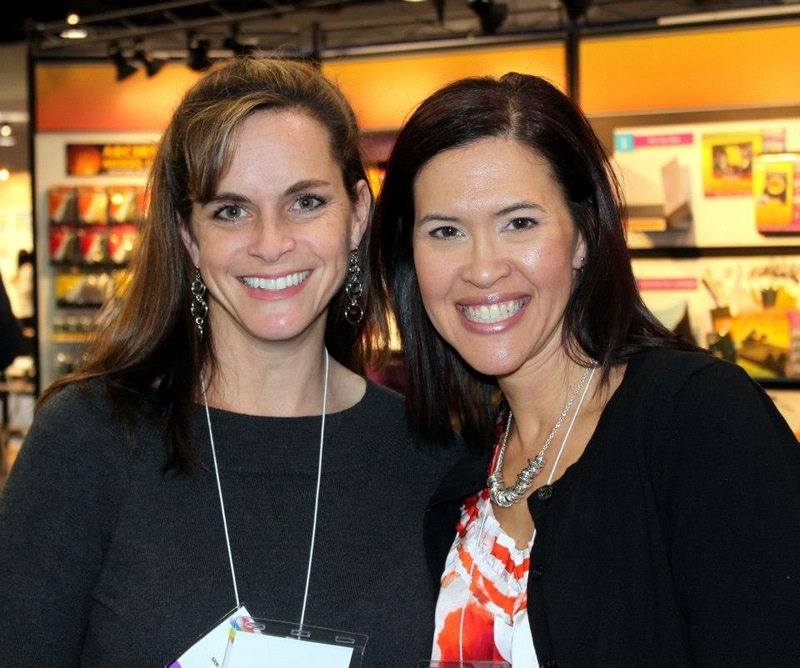 It’s a Hambo Blog Hop! And you can join us! Our jammin’ theme is “Name That Toon.” Using any Hambo image, either rubber or digital, create a project that represents and depicts a comic strip! Maybe it’s your favorite one you read as a kid, or maybe it’s one that you don’t even like! Whatever it is, we want to see your comic strip creations! The hop is scheduled for Friday, January 18, and is set to go live at 7:00 AM CST. All blog hop posts must stay at the top of the page for that whole day. A prize will be awarded to the customer whose comic strip-themed creation tickles the Bacon Bits’ fancy in a hammin’ jammin’ way! The winner will be announced on the Hoedown blog, as well as on the Hambo blog on Wednesday, January 23. If you are interested in participating, please email Judy at hambodesignteam@gmail.com by 11:00 PM CST on Wednesday, January 14. The blog hop order will be emailed to you on January 16. mSample blog copy for the hop will be available after you sign up, if you desire to use it. Come "Name That Toon" with us! I want to share a quick Valentines card I made using some inexpensive felt borders I got in the Target $ spot and using some SRM Stickers. Makes for a simple and clean Valentines card. Happy New Year My Peep! Happy New Year everyone! I hope you all had a nice holiday and time spent with your loved ones. We certainly had a wonderful time as a family as my husband took some rare amount of time than usual! However, we are trying to spend as much time as a family before he deploys to Afghanistan which is in a month. Partially why its been quiet on here... but I'm back! 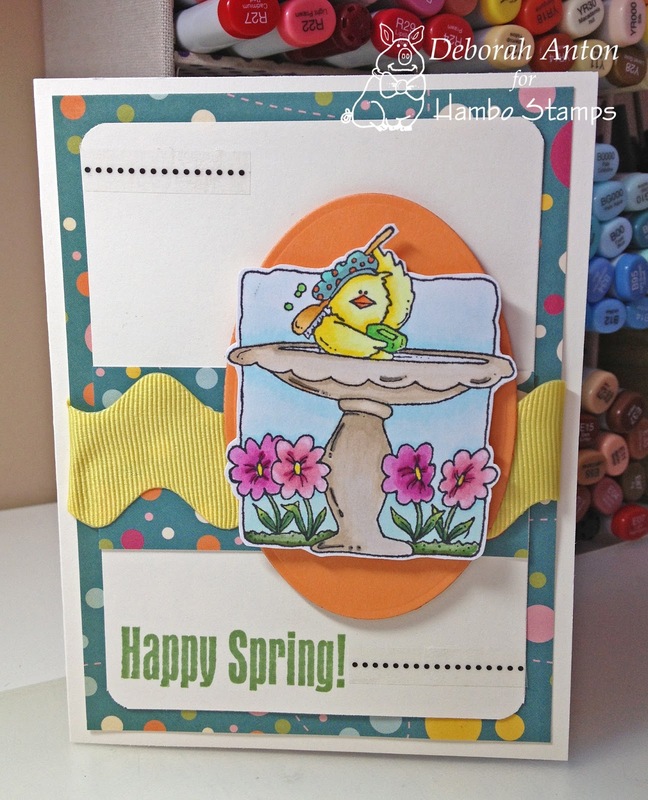 With that, I would like to share a cute image from Hambo Stamps- perfect for Spring! I know it's still Winter but I am longing for Spring. Aren't you? I stamped the image and colored it in with Copics. I then cut it out and popped him up between some grass cut out using the grass Die-namic from MFT. The butterfly is a sticker from Papryus while the sentiment is from Hambo. 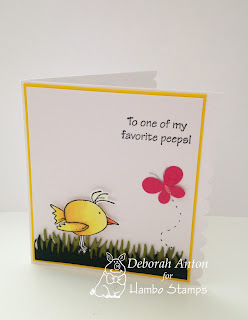 CAS and makes for a quick card for your favorite Peep!